In 2013, cryptocurrencies gained a lot of attention through the news and through a number of events that happened. The bitcoin is the most popular of these currencies, and it's starting to be seen more and more as a viable departure from some of the problems that people have with what are known as fiat currencies. For example, bitcoins are much less prone to inflation and manipulation. They have started to be seen and more and more legitimate, and some recent news from Las Vegas has made that even more the case. 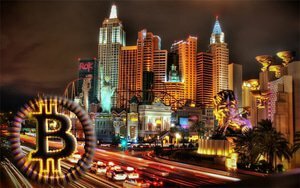 Two Las Vegas casinos have announced that they are going to be accepting bitcoins in some capacity. Althrough they won't be accepting bitcoins for wagers, yet, they are accepting them for things like booking hotel rooms, paying for meals at restaurants and purchasing items in the gift shops. The two casinos that have announced that they will be excepting this cyber currency are the D and the Golden Gate Casino. Derek Stevens is the co-owner of each of these establishments, and he showed a lot of enthusiasm for accepting the currency. "I'm proud that the D and Golden Gate will be the first casino properties to accept bitcoin. We're located in the growing high-tech sector of downtown Las Vegas, and like all things downtown, we're quickly adaptive to new technology. The timing is right for us to launch this initiative, and I'm happy to be able to offer this to our customers," he said. People who are interested in using bitcoins to pay for their stay at one of these two casino locations will be interested to know that they will be using the BitPay service to process payments. This service already handles more than six percent of the bitcoin transactions made in the world, so they really know their stuff when it comes to handling this relatively new currency. This news comes around the same time as Vera&John Casino announced that they were the first licensed online casino to accept bitcoin for deposits. It's clear that this cryptocurrency is gaining a lot of ground, and even though it's worth in the neighborhood of $700 right now, you can buy fractions of coins down to very small levels.